The new edition of Ophthalmic Disease in Veterinary Medicine is the ideal textbook for trainee and practicing veterinarians needing a quick reference in their daily work. Expert veterinary ophthalmologists will also appreciate this updated completely revised edition, the achievement of a teamwork involving three authors and five contributors, outstanding members of the international veterinary ophthalmology community. Hundreds of beautiful pictures and drawings facilitate a quick, easy, practical consultation and allow direct comparison to clinical cases. For each ophthalmic disease and disorder, the authors provide a detailed description of diagnosis, aetiology, clinical signs, prognosis and therapy. Although the main focus is on small animal species, the readers will appreciate the interesting comparative notes on the horse and the cow, and a section dedicated to presumed inherited eye disorders. 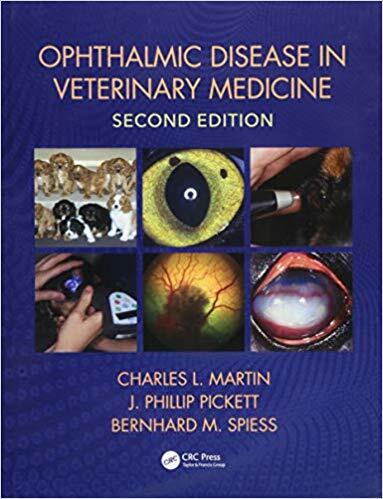 Ophthalmic Disease in Veterinary Medicine deserves a special space in the library of everyone interested in veterinary ophthalmology. Actually, it is a book to leave on your desk for daily use, so that you can read the notes and show the pictures to owners to help explain what is happening in their pet’s eyes.